Potatoes grown organically - Off Topic - Drive On Wood! No wonder you’re still making potatoes. Ours would be gone almost a month had we grown any. Yellow dock is a wide…well…I’ll get a picture and post it sometime soon Lord willing. For now I have to get some rest. Luke and Naomi and I went looking for mushrooms before supper. Spent about 45 minutes and found a good many. But we got poured on in the process. As soon as we got to the mushroom spot deep in the woods it started raining and quit about the time we made it back the road. edit: I just noticed that if you open the pic you see more of it. PNW wetside here the never/never let get established is cockle-burr. Non-native. Gets here in out of region brought in hay. Delivered manures always gifts us surpizes. My own-made and fewest surprizes. Just do not have enough from our chickens to compensate for the 122" rain a year soil leaching down weakenings. Been too long now since the last volcanoes fall-from-the-sky free re-mineralizations. 1982-92 were good growing years. The native garden edge growing-in nemeses I fight constantly is quack-grass. Evey little stem, root piece will regrow. My potatoes in-garbage cans “protected” and the open ground planted are just starting to grow from the last two weeks of 50’s, 60’s F. constant clouds, drizzle and rains. Here vegetative mulching potatoes is guaranteed death. Early blight. Then late blight. WE must keep hilling up with solar sterilized dirt/soil. With just a top of fluffed dirt “mulch” as a moisture retainer. Different microclimates, annual weather and base soil conditions demands different solutions. We each have a different set of gardening crossed to bear. Very interesting reading how other do dig-in, make-do, regardless. Eating, the proof of life producing. Ahhh,quack grass what a pita. I am surrounded by it. My initial war here was getting it out of my gardening spots. You could whizz bang it in a blender and spray it and I swear it would grow. Still creeps in along the edges, but pretty much controlled in the gardening areas. The rain wouldn’t have it any other way, would it. Nice to see the next generation of those who will use this knowledge. Is that a peach tree behind your son, I’m curious because of the leaf shape? Steve, have you tried other potato varieties? Breeding work has been done for blight resistance. Yukon gem is said to have broad resistance. I’m growing a quantity of seed this year, but mostly interested in scab resistance. We have blight in tomatoes, standard varieties are useless now locally. 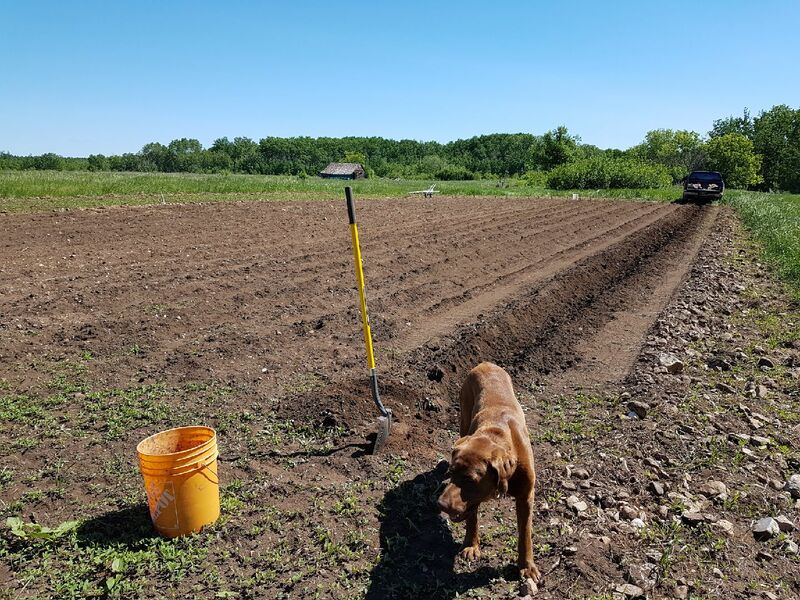 Potatoes are so varied, 200 approved varieties in Canada, most completely unknown or specialty, but I expect there’s a variety optimal for most growing areas, provided soil temperatures aren’t too high, or moisture excessive. Burdock is a tall prickly son $%%^%$% about 3-4 feet tall growing in waste places. It has marble sized burrs that cling to anything that touches it, Hard to get out of you pet’s hair! As I said $%%^%$%. Yeah, burdock… what a disaster. I guess like all plants it has a limit in climate zone tolerance, but I know it is totally happy here. Here it will grow 6 feet or a bit more. As mentioned the large clusters of burs will cling to anything, spreading the small sunflower like seeds far and wide. I have observed the seeds continuing to germinate nearly 25 years after the last contamination, not sure how much longer they may persist, but it’s not looking good at all. About 5 - 6 years ago they arrived on my land. They will grow in fairly significant shade, so tend to crowd out natural growth with their huge leaves and breadth. The only somewhat effective solution is spot spraying with Killex (2-4D, mecoprop, dicamba. A few walks per year with a backpack sprayer, for life, just to limit infestation in a local area. The roots are edible, best dug from first year plants in the fall. Peeled and boiled they are good eating. The garden seed trade offers Japanese burdock as a root vegetable, called gobo. Considering the above, this seems like a very negligent thing, as I don’t want to see wild burdock with even greater genetic diversity. I imagine in time some sort of insect pest or disease will instate a natural order, but it will likely be decades if not centuries. 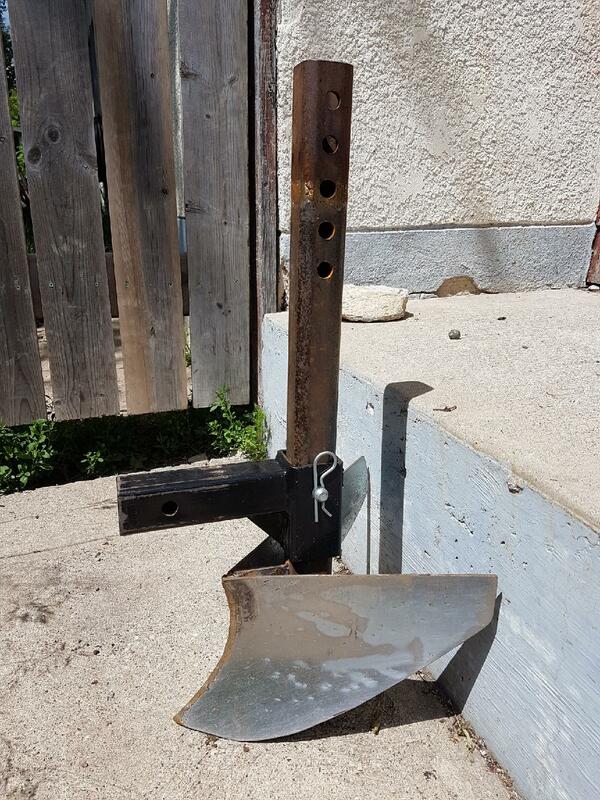 I was facing a potato planting job without the right equipment. I did have lots of seed potatoes and the land. 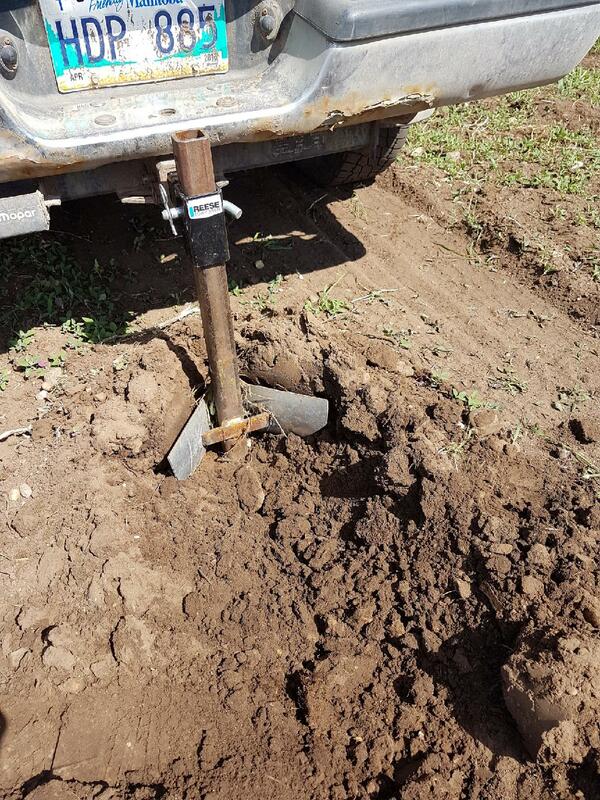 For next year I will have a ground wheel driven ripper and planter, but for this year I put together a simple ripper to open a furrow, greatly reducing the work. As crude as it is, it works quite well. Planting potatoes takes least of my time. I fertilise with manure, rotolill, level and put seed potatoes on top of the soil in rows. Then, l just cover it by hand about a inch deep. No more. When it comes out, about 5" high, l hill the rows to the top. When its 5" high again, l just scrape all the weeds between rows with a sharp tool and thats it. I may weed the biger weeds ocasionaly, the rest l let be. Picking potato bugs requires more dedication. And harvesting. This takes 2 days for me and my brother to achive. 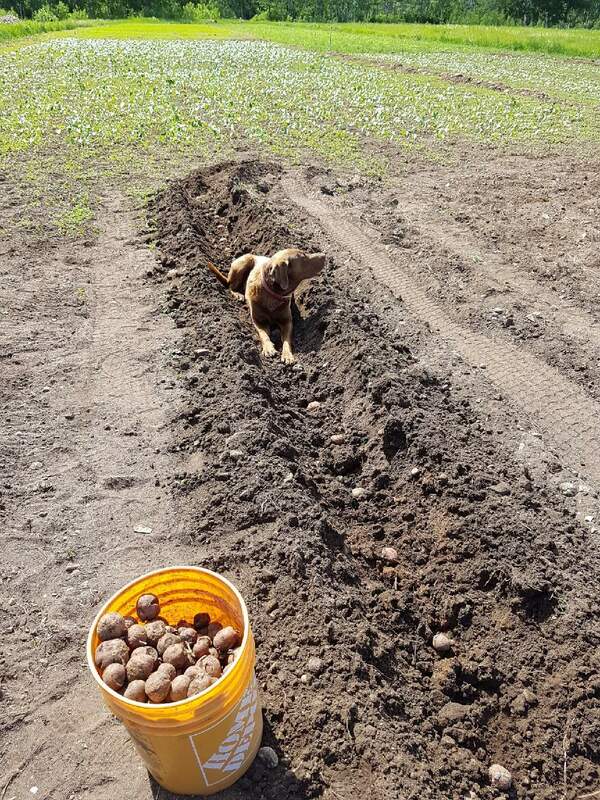 Great set of potato planting pictures GaryT. Yep. My dog-gone-dog like to diggin’ help too. I’ve had my best luck in the past with Yukon Golds. Half of what I put in this year. Yukon Gems are new one on me. I suspect with our AG USA <=> Canadian cross=border trade wars be impossible to get these shipped to me as live seed potatoes. A BC?Canada seed supplier West Coast Seeds can do all dryed seed but not any “live” out-of the dirt culture seeds. I am trialing this year the conflicting reports that the main potoato problems are infections passed on in the seed tisues versus infections in the base soils. Of course BigAgra chems work to keep alive. Expensive dependency. My fall back will be tring this year will be rutabaga’s which we have never done. Then onto more in-ground tuber starches from above the 45th North. “Exotics” originally from between 30 South to 30 North will always be a pain/problematic for us northerners. Potatoes, corn, tomatoes, peppers. then learn to love the one you can and do have. " an adapted base-wisdom quote. We could have made some fine beet and cabbage borsch in May from last years carry overs. I always plant yellow utabaga after the potatoes. I love the taste of it roasted with potatoes and a chunk of meat. Some make fun of me as yelow rutibaga is a animal feed voriety, but they are the stupid ones. The “human” vorietis dont have half the taste. And the “pig” voriety makes big, buttersoft bulbs that last trugh all winter. yeah, works fine. I have often thought of doing the same thing but I don’t have a 4x4. Just thinking about plowing that way a couple years ago…this year I didn’t have time to plow so I took the skid steer and “flipped” the dirt to plow it. 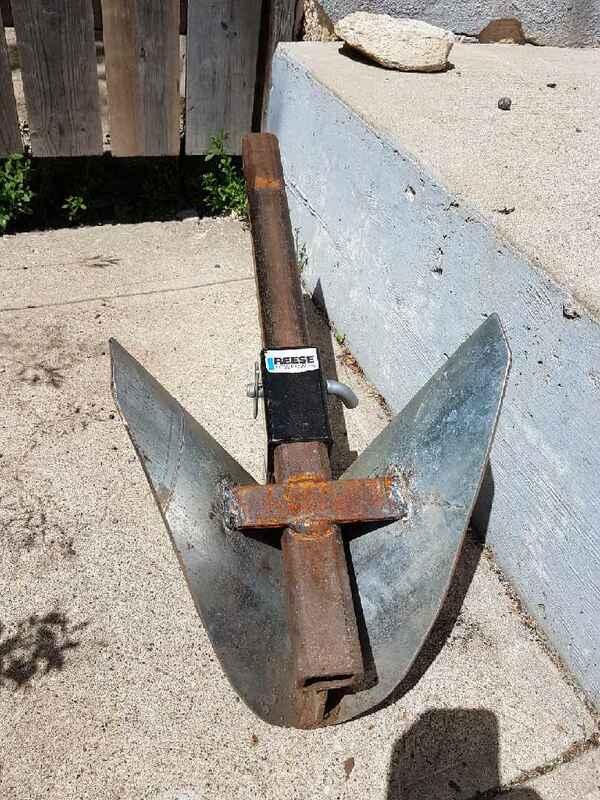 Dig in, pull forward, flip 3 or 4 feet of soil. back up, do it again. It took aboput 30 minutes to “plow” two of the three gardens. But I’m paying for it now. It turned it deeper than I ever have so the rocks came up again. I had pretty well cleared them, and also I am really weak on nitrogen. It reminds me of the old timers telling stories of the poor crops they made the first year they got a tractor. The tractors would plow deeper than the mules had ever plowed and they buried all their top soil too deep to make good crops. Guess that’s what I did. Our yields are much lower than usual, but we’re sorta glad actually. Not relying on produce for our primary income means we don’t have to worry so much about it. Already more busy than we want to be canning and freezing anyway. Beets yesterday, mushrooms today (the boys picked another five gallons today). beans tomorrow, pickles every other day. ANyway, thanks for the laugh and memory recall. I suspect with our AG USA <=> Canadian cross=border trade wars be impossible to get these shipped to me as live seed potatoes. Hi Steve. I believe you are right about shipping of tubers etc. Although in the case of potatoes, especially new varieties, that’s big business, enough to do stringent certification, or raise stocks from sterile tissue. In the case of seeds, I’m not even certain if that’s allowed cross border any more, Yukon gem is available in the US. From the description this variety looks promising if you are actually facing blight issues. It’s described as having a lower specific gravity than Yukon gold, but generally higher yields. Some make fun of me as yelow rutibaga is a animal feed voriety, but they are the stupid ones. The “human” vorietis dont have half the taste. I agree with you Kristijan, I believe we would call the yellow rutabaga turnip. I love them, though many don’t. I wonder if that isn’t some class thing from times past, as they were too easy to grow? Is anyone familiar with the fodder beets? Another high performing vegetable regarded as animal feed. Or sugar beets, very good eating, tops or roots. Regarding planting of potatoes, usual practice here is to plant about 4" deep, as heat or dry conditions could cause problems. Ideally I would aim for a lower trench to facilitate hilling, but the truck tended to push soil from beside the trenches. Sure! Fodder beets are widely grown here. I dont plant them becouse they need a whole season to grow, while tarnip? grows fast and you can use the same land twice. But, each year we add one feald to our land, and next year is likely fodders or corns turn. We used to plant a few for rabbits. The roots wuld be thrown in with the rabbits in winter and it took them about a week to finish. The roots weight up to 30 pounds! A nother bad reputation delicasy. Yellow carrots. Delicious. Anyone likes them? I grew some last year, said to be an Afghan or Pakistani variety, red, orange, yellow and white ones, quite large, this year growing for seed ( in separate plots). They seemed quite good to me, and quite vigorous as you say. Apparently selecting for orange carrots only was a European development of fairly recent origin. I new to me resource supplier. On the rutabega no-no . . . my current Belgium relitives tell me that after the last occupied no-fuel, no-tractors years in 1944 and 45 they want to never eat “starvation” rutabagas again. Accounts from 1945 to 47 Germans says the same thing. My on-shipbord trapped Pacific WWII Marine-solderer father-in-law would never eat potatoes mashed again. Had developed a taste only for oleomargarine. Wife and I only use real cows butter. We had to table both. And her give him any other starch substitute other than wonderful smooth creamy mashed potatoes with a floating center of melted butter. I have an uncle who hasn’t eaten rice since he left Viet nam in 1969.